In this photo from Thijs' Tumblr, an Arturia MiniBrute rests above an NI Maschine in his studio. At 0:24, he says that he likes this synthesizer and that it's very efficient. All but a few keys of the MiniBrute can be seen taking up most of the right-hand side of Marcus' Instagram photo. Having completed his "Against The Clock", Alix Perez takes us on a studio tour, where you can spot the Arturia Minibrute on the left side of his desk. > "There's my little modular system and I stole Szary's Arturia MiniBrute, which I'm using for a few songs. I re-programmed some sounds we used the modular for in the studio. It's nice because you have much more modulation moments. We have one part in Reminder, which we call the 'Chemical Brothers part' as it's full of modulation." Left on the table the minibrute is spotted. In this interview/video of Vince Clarke he discusses how he uses the Arturia MiniBrute. "making some electro and scratch tracks for a robot dance competition." in this photo we can see his minibrute.. 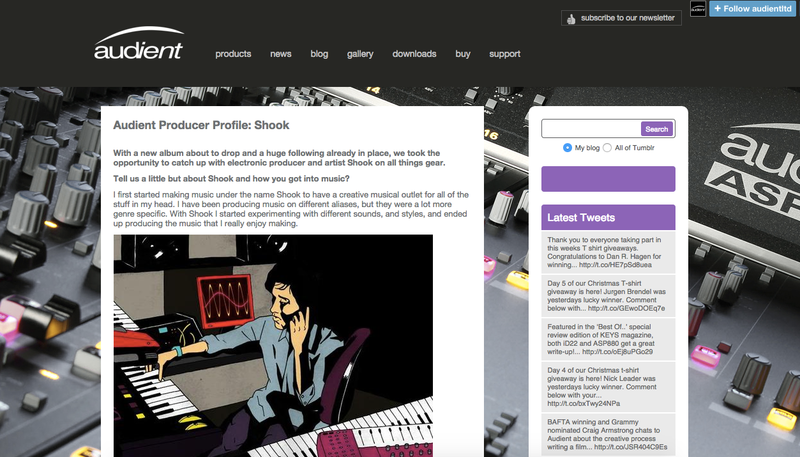 In this Audient Producer Profile from [Audient's Official Blog](http://blog.audient.com/post/96087135159/audient-producer-profile-shook), Shook is asked: "Q: What’s your synth setup? A: I really love old synthesizers and new ones. For my album, I used a lot of [Prophet 08](http://equipboard.com/items/dave-smith-instruments-prophet-08-synthesizer), [Juno 60](http://equipboard.com/items/roland-juno-60-synthesizer), [DX7](http://equipboard.com/items/yamaha-dx7-synthesizer), Arturia Minibrute and some old string synthesizers like the Korg PE-1000." Using it to control a euro-rack modular system. This item can be seen 16:24into this video at the Future Music youtube channel in celldweller's studio tour video. 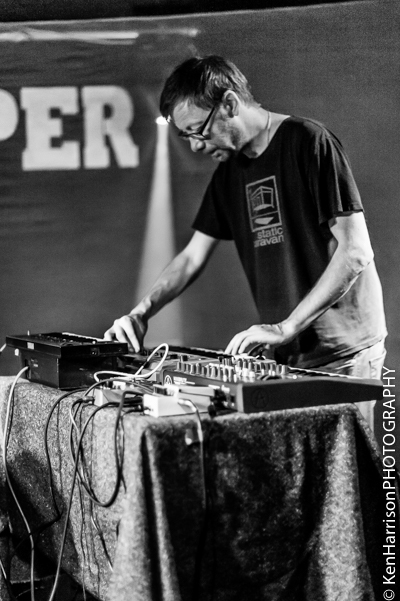 Among Phil Winter's electronics in this picture as an Arturia Minibrute, recognizable by the Arturia logo on the back and distinguishable from the Microbrute by the placement of the knobs. In the Video he use an Arturia Minibrute. Ry X plays a Minibrute at "Festival Musiques en Stock" 2016. It can be seen very clearly at timestamp 43:57 into this video. This video features Utley using the MiniBrute to create many sounds. An Arturia MiniBrute is a part of the Anonymous Animal setup in this video. Tothead uses Minibrute mainly for lead synth sounds. It has been modified to have a sequencer instead of regular arpeggiator. The sequencer can be heard very often during his live acts. Tothead avoids use of pre-recorded seqences, rather to record them in real-time. In many Instagram videos and multiple other social media posts, aNTOJE uses the Arturia MiniBrute's distinct sound in many tracks. "I have a Macbook Pro, Ableton Live, Akai midi keyboards, Universal Audio soundcard, PMC monitors, a bunch of VSTi like Arturia, Diva, Native Instruments, Korg and a few hardware synthesizers like Prophet 6, Pro 2, Mini brute or recently a Modor NF 1." 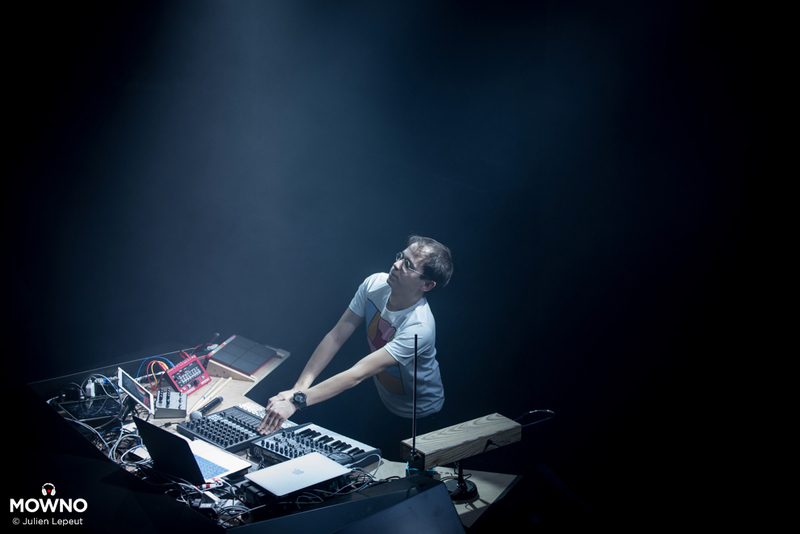 In the second photo of the article Minibrute is visible to the left bottom foreground. Honestly, I really dont like the build on this synth. Honestly, I really dont like the build on this synth. I dont use it that much however I bring it to my friends a lot who jams guitar and Ill lay down some abstract bass lines haha. So its not sturdy, how's the sound quality. I was thinking of buying one or maybe getting the micro to use as a module because they are so damn cheap. The sound quality is meh. For me, I just understand synthesis to much to appreciate how little this synth can do. I picked one up when they were first released. I was really disappointed with the build quality as well. The first time I played it, the metal weights under the keys started falling off. I ended up taking it back for a refund. Build quality aside, it was a nice sounding mono-synth IMO. I'm a fan of the Steiner Parker Synthacon filter though. While build quality can sometimes be hit and miss, my early issue MiniBrute has been going on strong and is great for complex basslines and leads. Occassionally I think about selling it, but after playing with the aftertouch, the enhanced ultrasaw and additional noise generator, I am reminded why I kept it. Only downside is the size - it's a bit large! I love the fact that you can´t access to presets nor save your own, because the heart of this instrument is the ability to design each time you turn it on. The soul of the instrument is in his powerful sound. Very interesting little beast. Love to use it along with the Analog Rytm for a minimal techno jam. I think if you combined this along with the new Korg SQ-1 you could take that kind of jam into the club. May I ask if you have since tried adding the Korg SQ-1 to your Minibrute? Just wondering how well they sync via cv/gate or midi? Thanks. Hey, not been on here in a while so just saw your comment. I have not actually, only just picked up an SQ-1 the other week. Unfortunately the audio outputs of my Brute are broken so needing to get it fixed before testing. In the past I had a success with syncing via CV with Doepfer Dark Energy. The owner of the Arturia Mini Brute is one of my bandmembers, but from time to time I'm allowed to use it in my set-up. I sai "allowed" on purpose, because we both enjoy it soo much to play with the Minibrute. In very short time you have created a very specific sound and you don't need to know much about oscillators and synthesizers in order to do so. Very great instrument! It is a monosynth, which has built-in tricks to make it sound like a fat multi-oscillator modular. The name "brute" comes from an option which returns the audio signal back to the synth, making it sound very rough and metallic, however if you do not set the waveforms higher than 50%, it can sound soft and beautiful. The variety of sounds is great. Minibrute is affordable yet not easy to use after all. It is very understimated, because many artists do not really understand the mechanics and push the knobs and sliders to the max most of the time. Moreover it can be officialy "hacked" and with one short line of hex you can switch from arpeggiator to sequencer, making the Minibrute a very powerfull tool. Analog for the masses? For a miserly sum, this bad boy offers users a hands-on approach to analog synthesis. There's a throwback factor in the fact that there are no presets. Forget about hidden menus and little screens. What you see on is what you get, functionally speaking. Tonally, this synth definitely feels analog. It also feels like its got a unique voice all its own. It's not a Moog, it's not an old Korg, and its not some Oberheim. It is its own thing. Luckily, within the scope of its parameters, you've got enough leeway to craft lots of different sounds. At any point you can bring up a sub, a square wave, a saw, a triangle, white noise, and an external input. No sine wave, but you can get one by being subtle with the sub. Moreover, each one of those parameters can be mixed in with a dedicated fader and most can be tweaked with individual knobs. Some provide cool phaser and chorus effects as you play with the rates. Again, tactile faders also come into play when sculpting the envelope of your wave. I prefer immediate attack, mid level decay and sustain, a just a tiny bit of release. Your ideal sound may vary, and thankfully you've got the possibility of also crafting lengthy pads or tiny bleeping bursts of color. Personally, most of my tweaking happens on the filter banks. This beastie is a monster when it comes to doing frequency sweeps. At times you can enter the realm of unusable high pitched squeals if you overdo it on the resonance, but generally the filters are all good fun. You can also go wild with the much-vaunted Brute Factor knob. That one can introduce a degree of distortion that can really give the sound an extra boost. There's way more, too. You can shape each wave with a subset of faders, and you can play with a whole mess of LFO parameters (all of which can be blended in via a dedicated wheel). Also, you can arpeggiate at your heart's delight. There are enough variations on board to keep it interesting. In addition, you can simply use it as a MIDI controller thanks to its very sensitive keys. Finally, since it has Audio In, you could potentially just use this thing as a wacky effects unit. It's done pretty interesting tremolo and sweep filtering to my guitar, and I bet it could do far more if you do real time knob twisting as you insert prerecorded music. So far there's been praise, but what about the cons? Well, the keyboard is a bit annoying. The keys are the right size, but its only about two octaves. If you want to shift, you'll have to press buttons for that. Moreover, when I got mine, one key was already finicky and it only works if I press at the center rather than the edge. Also, many of the LFOs aren't that useful, so that's a drag. I also dislike how the arpeggio doesn't respond to the order you play the keys that constitute a chord. Want to use it as a sequencer? You'll have to do some hacking. Lastly, there will be a steep learning curve at first; expect to end up getting very useless sounds very quickly. It will take a while to truly grasp what each knob does. Since you can't save any presets, you'll eventually have to intuitively grasp what works best for your sound design. Regardless of these gripes, I'm pleased with this monophonic synth. I've used it for pads, leads, and bass lines. It's got character by itself, and it has interacted very well with my effects units. It has also been study enough to survive international travel intact. It's not grossly oversized, after all. Any fledgling synthesist ought to consider starting off with this unit. It might not be a Minimoog, but it's still a powerful device that can inspire with its simple old school approach. It'd be cool to give that a go. I'll admit I'm not too loaded with equipment, though. What I've listed is all I've got. nah, you get loaner units from the manufacturers to do reviws, in the process you get to test out a lot of stuff... but you need to forge relationships for yourself, right now the admins pretty much just get offers for reviews from string companies. I had to go out and make friends with effect and synth manufacturers on my own via facebook and stuff. @jimmarchi1 that might require a bit more chutzpah than I can muster! I actually use the SE edition with sequencer for mono madness. My go to lead machine. It can be very gritty and ready for thrash but the real secret is to not turn the wave form volumes past 50%. Then you get those nice warm analog sounds. This is a great analog synthesizer! I love how you can create some cool things with this. When I make electronic music I love how my sounds are unique. c: You guys should check this baby out. Great analog monosynth for the bucks! Well made, really fat and gritty filter and really good feature when it came out. Little bit ''outdated'' with all the analog synth that come out lately, but this one really start the ''budget'' analog synth recent era. Use it for bass/lead/Fx in my live sets. Arturia Minibrute Analog Synth, Small, Simple. As a beginner in synthesis, I found it very inviting, begging to be experimented with, played, and enjoyed. The frame, knobs, and switches of the keyboard feel solid, durable. The keybed and sliders, not so much. But as long as you're not thrashing, I imagine it all working forever!